This is probably one of the most duplicated and modified recipes for the sauce. Posters constantly claim “This is the original!”, and the even more ridiculous “My [insert relative here] got this from the owners!! !” One of the more common rumors is “This was published in the Flint Journal some time after the death of the man who created it. His wife allowed it to be published.” However, Brayan’s wife Velicia passed away in 1976, while Simion himself lived until the age of 100, not passing until 1990, so that particular rumor is patently false. The simple fact is, this recipe is actually nowhere near Simeon O. Brayan’s all-beef-heart/no tomato original sauce from 1924, a version of which is made by Abbott’s Meats. Versions of this recipe have appeared over the decades in the Flint Journal. There’s also a version on the back page of ʺTwo to Go: A Short History of Flintʹs Coney Island Restaurantsʺ, by Florine, Davison & Jaeger (2007, Genesee County Historical Society) and in the chapter on the subject of the Flint Coney in “Remembering Flint, Michigan: Stories from the Vehicle City”, by Gary Flinn (2010, American Chronicles (History Press)). I recall my mom making this back in the 1970s from a recipe handed down by her Aunt Fern. We make no claim that it’s the “original recipe for the sauce”. No one else should either. That’s simply not true. Brown the ground chuck in the skillet till itʹs nice and tender. Dump it into the colander and let it drain. Push on the browned meat in the colander with the back of a spoon until most the grease is out, and then dump the meat into the sauce pan. Install discs onto the front of the meat grinder for a fairly small grind and grind the hot dogs into the glass dish. After digging the rest of the ground hot dogs out of the inside of the grinder, add the ground hot dogs to the browned meat. With the exception of the chili powder and the salt and pepper, add the remaining ingredients to the sauce pan and mix it all as completely as possibly. Start heating the sauce on the stove over medium heat. When it comes to a simmer, cover the saucepan, set the burner for low heat, and let the sauce simmer for 20 minutes, stirring occasionally to prevent scorching. Add the chili powder to the sauce and stir it in well. Check the flavor of the sauce and add the salt and pepper to taste. Cover the sauce again and let it simmer another 10 minutes to let the flavor develop before serving on grilled Koegel Viennas in natural casings on decent (not wimpy) steamed buns, all topped with a squiggle of a rich yellow prepared mustard and some chopped onion … or on nacho chips with cheese and jalapeños. Why is there less ground chuck in these recipes than in Aunt Fernʹs original version? Because of the difference in volume between browned 70/30 ground beef and browned 80/20 ground chuck. 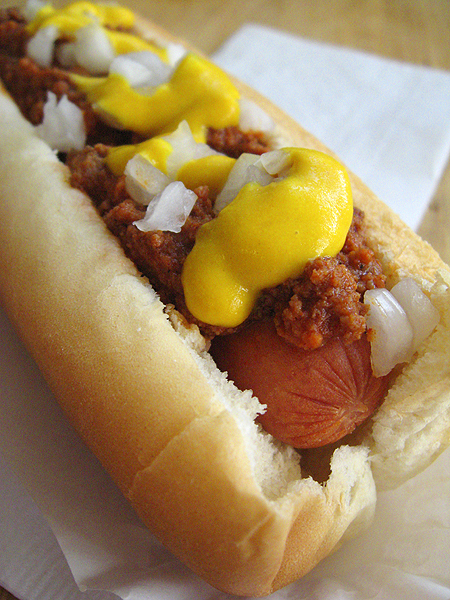 The hot dogs you grind up will affect the flavor of the finished sauce. Using Koegel Viennas for this makes a lot of sense. Yes, tomato sauce comes in 8 oz cans. Use 6 oz for this recipe. Just drink the rest, itʹs good for you. Donʹt use garlic powder instead of minced garlic. Throw that powdered stuff away … itʹs not the same. However, granulated garlic is an excellent substitute for minced garlic. While itʹs possible to grind the hot dogs in a food processor (on slow speed, using the blade labeled ʺshredʺ), a better texture is created by using an old‐fashioned hand meat grinder. These are available in specialty and antique shops, commercial food equipment dealers, and the cooking section of Cabelaʹs in Dundee. An electric or commercial meat grinder should be used for bulk and larger amounts. There are versions of this recipe that say to add onions, not to brown the ground beef first, and to slow‐cook it all day long. Not everyone likes onions, not browning the ground beef first means greasy sauce later, and if you do use a crock pot for this, add the chili powder, salt and pepper much later in the cooking process. Grease from the ground chuck should be collected in a glass dish, cooled, and disposed of properly.